Well, we finally made it. At times it seemed as though we would never get here. First, this year we were delayed a week because of booking complications for our accomodations. Then, our flight out of Toronto was delayed 45 minutes, causing us to rush frantically between terminals in Los Angeles. We needn't have bothered. We got there just in time to make the final boarding call, got on the plane--and sat, and sat, and sat. On the ground! For two hours we sat. The lavatories weren't working and the part they needed to fix them? In Chicago. Since we were nestled into seats at the very rear of the plane (right next to the lavatories) we had considerable investment in having fully functioning toilets! After numerous "updates" as to why we weren't in the air, the United crew eventually herded us onto another plane. We finally arrived on Maui three hours late and a lot more tired than usual. ...and the "few" we saw were cranky. We didn't get a single turtle picture. The sun did break through a couple of times, making for some *hohum* typical Maui-paradise rainbows, but the wind was gusty and there was more rain than sun. We tried to stick with it, but the lack of turtles coming to the surface eventually discouraged us. We came ashore, wondering whether this would be a summer without many honu. It wasn't a promising start. Honu heads popped up regularly but the choppy waves and gusty winds made manouevering our kayak both difficult and exhausting. 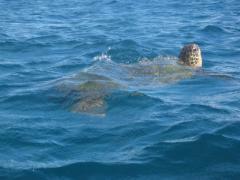 We figured we were in for more than our usual fare of photos of just water where a sea turtle should have been. 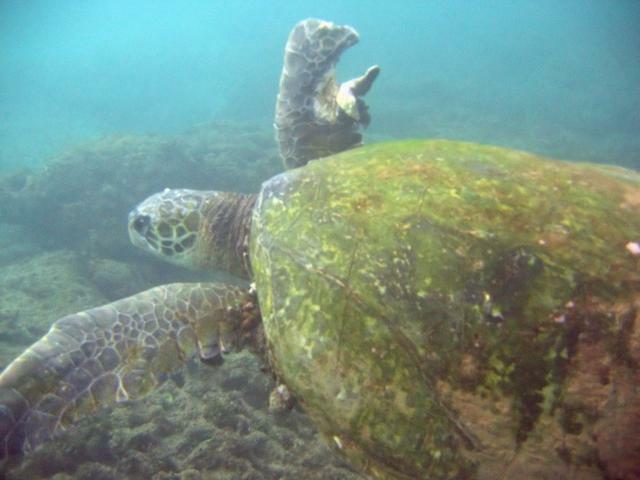 It was also frustrating for us to recognize honu and not get actual confirmed 2005 first-sighting-documentation! It wasn't a dead loss, though. We managed to get a few recognizable profiles, including two of our wonderful ladies: Tutu and Tiamat. (We've known Tutu since 1990 and Tiamat since 1991, which is a long time to know any wild animal, let alone a marine reptile.) The most interesting thing, though, was that our first identified sightings of the year didn't come from a dive. It was a perfect illustration of how the kayak has expanded our horizons. We have only a limited amount of energy, so we had to decide between diving Saturday afternoon or taking the kayak north to the foraging area that we discovered last August. Considering that our first dive of the summer would demand washing/rinsing wetsuits and ensuring underwater camera housings were fully watertight, while our "turn-key ready" kayak would allow us to take an afternoon nap, we chose--the kayak. In the late afternoon, we paddled to the foraging area, and then took turns snorkelling and taking pictures. This was actually the first time we dipped our butts into the ocean. Yes, a very late start for us. We expected to see some old friends. Sure enough, Tutu was there, grazing calmly. 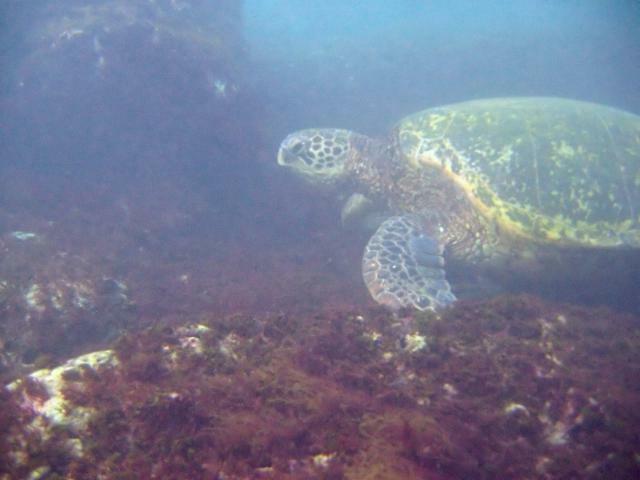 Of all the honu we saw, she was easily the most relaxed, not even perturbed when a school of snorkellers from the nearby condos approached. Since we also found her there most days after she returned from nesting at the French Frigate Shoals late last summer, we can now assume the north forage site is Tutu's regular banquet-and-buffet. What surprised us about this forage site is how different it looked compared to last summer. Many of the rocks that used to provide anchor for seaweeds and algae were buried by sand! This might hint at lean forage-pickings for the honu this summer. We'll see, since for now it's too early to tell. Although we're used to it, it was still disturbing to see on many honu the effects of the demon FP. Perhaps the worst case was 2004 Turtle 99. This unfortunate male had numerous tumors last summer, but this year his right flipper has simply rotted down to a stump, with a good-sized tumor still attached. Still, he exhibited a healthy appetite and shows no sign of wasting away. Most of his tumors are stable or actually shrinking, so he has a good chance of surviving the disease--though his right flipper clearly didn't. 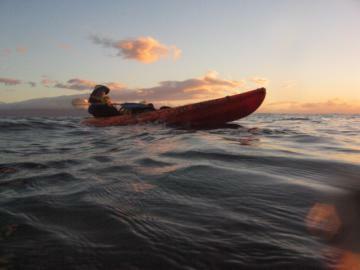 These first few days confirmed (as if we hadn't already realized it) that our wonderful little kayak has opened up a host of new opportunities. 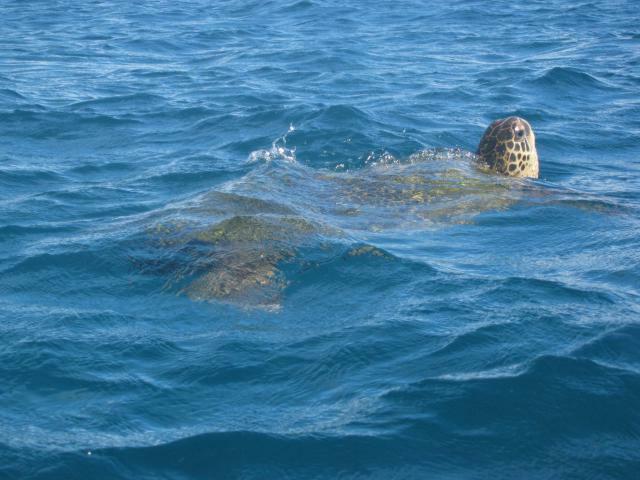 Not only does it expand the area we can cover, it will allow us to continue to observe the honu after we will no longer be able to dive. 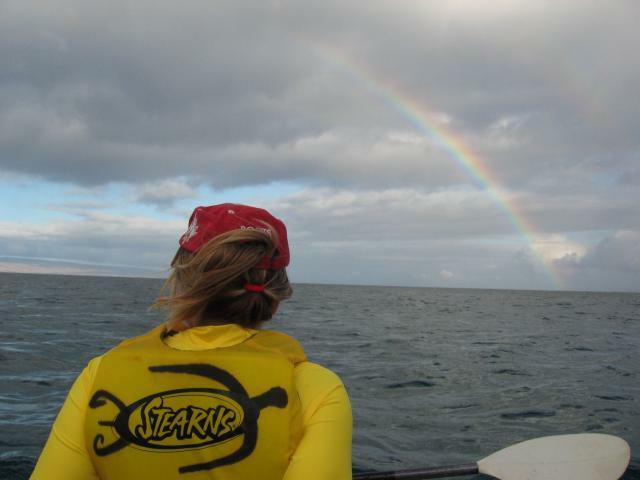 A couple of years ago, if anyone had suggested that we'd be on Maui for four days before our first dive we'd have thought they were crazy. Certainly, we would have thought that we'd go crazy ourselves if we had to wait that long to dive. Now, although diving is still number one, we know that we have an alternative--one that we've come to love almost as much.